Among the U.S. Army soldiers being treated by Colonel Vincent “Killer” Kane at an insane asylum based in a castle is astronaut Billy Cutshaw, who has a fear of dying in space. Cutshaw is meant to be the same unnamed astronaut who is told by a possessed Regan MacNeil that he will die in space in Blatty’s novel The Exorcist. 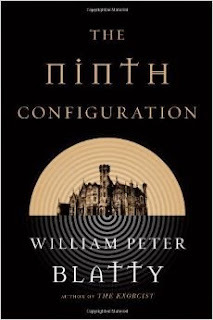 Since The Exorcist takes place in the CU, so does this novel. I was unaware if the Exorcist connection could you elucidate? There are a few crossovers for the Exorcist. Win included Jean-Marc's novel The Katrina Protocol, which mentioned Father Merrin in Volume 2. In Matthew Dennion's "The Quality of Vengeance," Jacques de Trémeuse (the future Judex) refuses an offer of power to take vengeance on the banker Favraux from Pazuzu. Dennion's story "The Angel and the Exorcist" features Father Merrin, the Nyctalope's foe Baron Glo von Warteck, the Japanese comic book and cartoon character Ogon Bat, and the Ring of Set from Robert E. Howard's fiction. In Justin Gustainis' BLACK MAGIC WOMAN, the first novel in his crossover-heavy Morris and Chastain Supernatural Investigations series, it is mentioned that Quincey Morris (the great-grandson of the original Quincey from DRACULA, whose wife died in childbirth before the events of Stoker's novel) once spent an hour in a townhouse in Washington’s Georgetown section where two Jesuit priests died performing an exorcism to save a young girl.